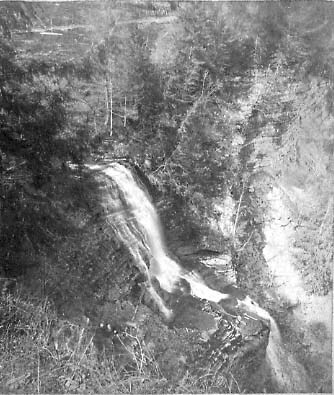 "300- Wolf Creek near its mouth"
This view of the Wolf Creek Cascades was taken along the west bank of the Genesee, north of the creek. There is a set of four falls along the Creek in this area, tumbling a total of 225 feet to the Genesee River. Rising near the salt mine at Silver Springs in Wyoming County, the stream has a higher salt content. Wolf Creek also passes through the nearby village of Castile on it's way to the Genesee. Another view is found below. Myers & Sutton, Hornellsville, N.Y. 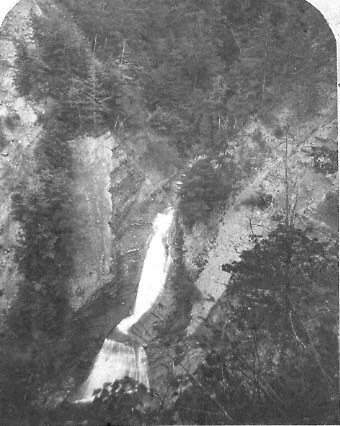 This image was taken from the west bank of the gorge, south of the Cascades. Note the road in the upper left hand corner of the photograph - it crossed the Creek on a wooden bridge. This was the general location of the Whaley's sawmill, where Jesse Jemison and his brother John were hired one May to help skid boards down to the River. That evening Jesse was killed in a fight with John. For more information, see Mary Jemison's Children.